The project applicant is the Pebble Beach Company. The project would create 24 inclusionary housing units near the Pebble Beach project site. The Board of Supervisors unanimously approved the Pebble Beach Inclusionary Housing Project in August 2016. Residents appealed the project less than two weeks after its approval by the Planning Commission. The Board of Supervisors is expected to hear the appeal on August 23rd. The Monterey County Planning Commission unanimously approved the Pebble Beach Inclusionary Housing Project in June 2016. As part of processing the Pebble Beach project, the Planning Commission, at its May 30, 2012 meeting, recommended that all affordable housing units be built onsite, instead of accepting in lieu fees for the units, unless an alternative site is found on the peninsula. The housing project was approved in July 2012 with stronger language about affordable housing. The project’s inclusionary houses are off of Congress Road. 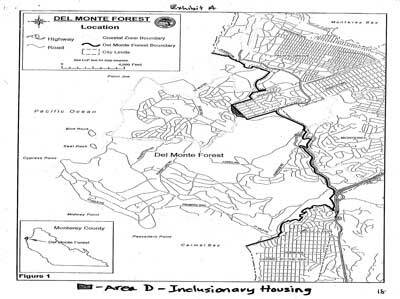 Credit: Monterey County Housing Advisory Committee Board Packet, January 2014. We plan on working with the Pebble Beach Company, League of Women Voters of Monterey County, Monterey Pine Forest Watch and COPA (Communities Organized for Relational Power and Action) to ensure the affordable housing is actually built. The Monterey County Planning Commission will hear the Pebble Beach Inclusionary Housing Project on Wednesday, May 25, 2016. Download the Public Hearing Notice.